Bullish trend reversal patterns. PnF formations. Point and Figure Buy/sell signals. Inverted Head and Shoulders Pattern The inverted head and shoulders pattern is found in candlestick, point and figure, and chart patterns and is considered one of the most reliable reversal patterns. The price forms a low on column one, followed by a period of consolidation. A second low is created followed by another period of consolidation, the right shoulder is then formed followed by a buy signal as it crosses the neckline. 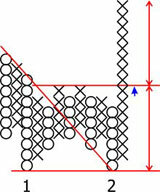 Parralel support and resistance lines can be drawn as well as a visible neckline. The height of the lowest low should give a projection of the strength of the upward move. Triple Bottom The triple bottom is a variation of the inverted head and shoulders pattern. 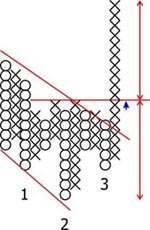 This pattern consists of three lows of similar height. After the third low is formed and the price movement breaks the neckline, a bullish signal is given. The expected rise should be of similar height as from the neckline to the low. 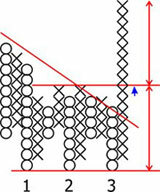 Double Bottom The double bottom is a variation of the triple bottom pattern. This pattern consists of two lows of similar height. After the second low is formed and the price movement breaks the neckline, a bullish signal is given. The expected rise should be of similar height as from the neckline to the tops. It is important to note that before the breakout, the trend line is broken. Bullish Rectangle Reversal The downtrend forms a clear period of consolidation, the resistance line is then broken on a heavy volume day, it is at this point where the bullish signal occurs.